I picked Freedom Romance And Jewels Eyeshadow Palette from all the available versions. The Palette consists of a vibrant and chromatic combination of eyeshadows. When I placed an order, I had second thoughts and I was about to cancel the order but I shook the thought since it is inexpensive. 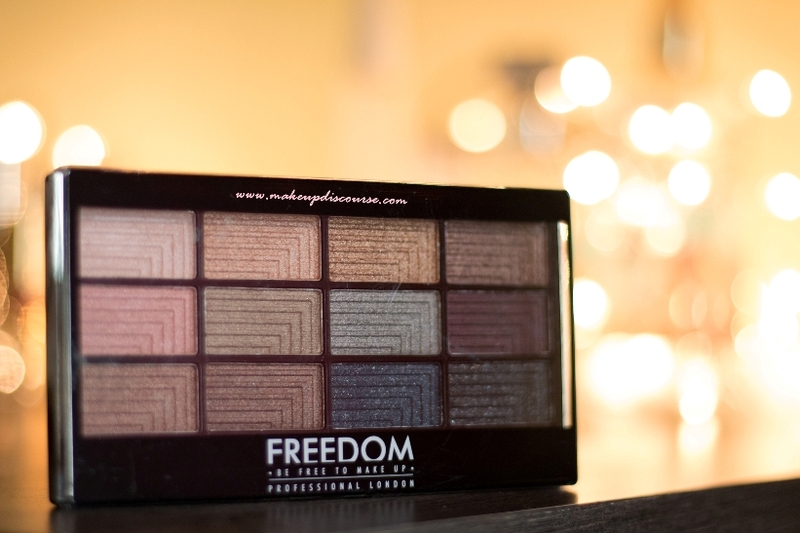 Freedom Makeup London Pro 12 Romance And Jewels Eyeshadow Palette is a union of both pale and dark hues. The Colours are co-ordinated Cool and Warm tones with either contrasting finish. Most Colours have a creamy texture while some are powdery. There is quite a fall out with the powdery textured eyeshadows in comparison to the creamy finishes. Freedom Makeup London Pro 12 Romance And Jewels Eyeshadows are not named. I am depicting and categorising them in terms of texture, blendability and pigmentation below. The staying power though is average but can be prolonged with a better base underneath. These stays on my eyelids for 4 hours without creasing with Urban Decay Primer Potion. And it does start creasing and transferring on the upper lids post 4-5 hours. 1st is a Warm Pale Peach Colour in Pan. The swatch appears White with soft Gold and Silver frosted/metallic finish. 2nd is a Rose Gold Colour in Pan. The swatch appears Pale Peach with Gold, Silver and Pink reflects. 3rd is a Rich Copper Clour in Pan. The swatch appears exact as in the pan, a metallic Golden Copper. 4th is a Copper Brown in Pan. The swatch appears Copper Brown with flecks of Gold and Copper sheen. 5th is a Peachy Pink in Pan. The swatch appears exactly as in pan, A Peachy Pink with Golden metallic finish. 6th is a Pewter Gold in Pan. 7th is a Silver Grey in Pan. The swatch appears Grey with Silver metallic finish to it. 8th is a Burgundy Brown in Pan. The swatch appears a Rich Burgundy brown colour with Red and copper metallic finish. 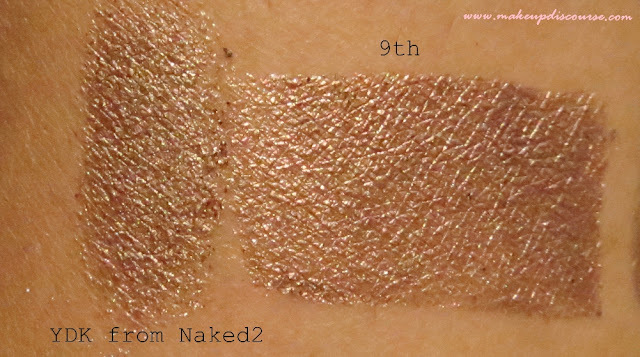 9th is Bronze Gold in Pan. The swatch appears exact as in pan, A Mixture of Bronze and Gold with dark brown and copper metallic reflect. 10th is a Bronze Brown in Pan. The swatch appears Burgundy Brown with Copper reflects. The Colour is very similar to 8th Eyeshadow. 11th is a Navy Blue in Pan. The swatch appears Navy Blue with flecks of Silver. The finish is matte barring the flecks. 12th is an Onyx Black in Pan. The swatch appears darker than in the pan, a black with silver flecks. Freedom Makeup London Pro 12 Romance And Jewels Eyeshadow Palette is unique with the combination of metallics, chromatic and reflects. I would select this exclusively for Holiday Season with the finishes. 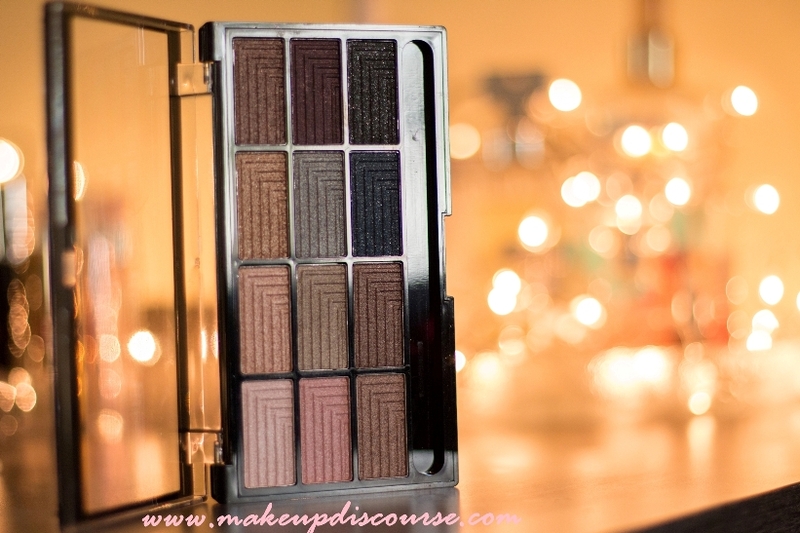 This palette has terrific shades of Copper and Bronzes, either in base or reflects. I have used this palette here. Recommendations: For the price, I think this would be a great purchase if you don’t prefer or have started out with metallic or mentioned finishes. Definitely Inexpensive. I see myself making use of this palette in plenitude this holiday season.